Ladies and gentlemen, start your engines! Summit Racing has all the ignition and electrical components you need to crank over your circle track engine and keep it running at a high level. Our huge in-stock selection includes ignition boxes and controllers, spark plug wires, distributors, alternators and generators, starters, spark plugs, and more. 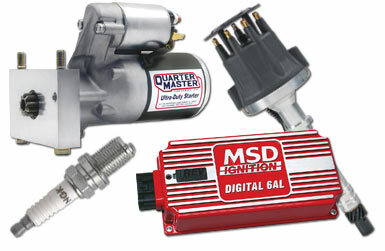 Give your vehicle’s performance an added jolt with top-brand ignition and electrical parts from MSD, ACCEL, Bosch, Davis Unified Ignition, Taylor Cable, PerTronix, JET Performance, and many others. Shop now!